Sorry for neglecting you guys again. Orientation and Mobility this past week was fun, and kind of scary. 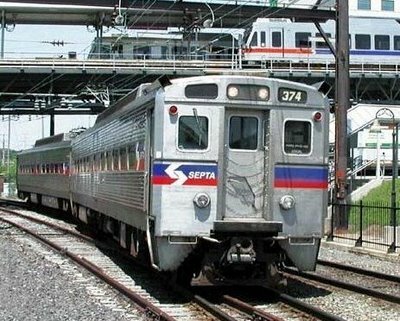 As you can tell from the title of this post, I “graduated” to SEPTA Rail travel. This was my first EVER trip on a train or to a train station… EVER! Far be it from the little things that amuse folks like me that have never traveled before. I’d happily make a trip to just go sit on a blog friends couch to simply say I made the trip! – I’m a little crazy I know. The trip started like all others I have been on for the past few weeks. Catch the SEPTA 93 bus here in town and ride it all the way to Noristown Transpertation Center (NTC). But Elaine was not meeting me at the bus this time; it was up to me to navigate across the NTC (not really a short walk and across traffic) to meet her at the SEPTA Train platform at NTC, to catch the 11:17AM R6 train to Market Street Station; one of the first main stops along the line. Meeting Elaine at the station platform, she was happy and I was relieved to have arrived in one peace. She told me when the train was coming, and where I was to ask to get off. She gave me my SEPTA Training Pass (cool pass that allows O&M students like me to ride for free with an instructor). She told me to mind my first step up because this platform was not level with the train, and it’s kind of a big one. And like bus rides to let the conductor know to please announce my stop and to make sure this was actually the R6 train! With a loud squeal and a hiss, the train pulls in. A rush of people flood to get on. Up the steps and make a right I went. The interior was very nice, with plush seats and well lit, a row of three seats on one side and two on the other. I went about half way down and plopped in. Elaine snuck off further away, but still in the same car to observe. With a toot-toot and a hum, the train was off with in a minute. The conductor made his way down collecting tickets. I showed him my pass with little fuss (some times drivers fuss!) and ask him to announce Market Street Station… no problem sir. The train ride was about 40-minutes to Market Street Station and I sat back to enjoy the view. The most notable landmark this line went past was Temple University; I could look out and see the football field as we passed. COOL! We arrived at Market Street Station, and the conductor announced the stop, by then the train was full of people and students, and a flood of people and me, made the mass exit to the platform. I stepped off to the side and waited for Elaine so we could continue the lesson in and around the station.